In 2007 I lived in the Central Florida area. All of my friends were getting their real estate licenses. An acquaintance in college, managed to pull down a $400,000 house with an interest-only mortgage. 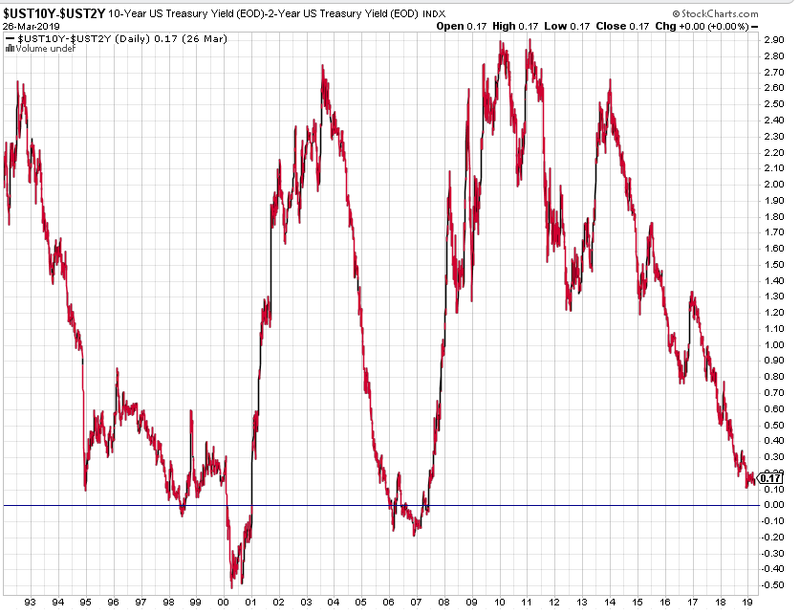 We know the end to this story, but there were warning signs..
Around this time is when the yield curve inverted. Soon enough, the market and economy took a plunge. A decade later, parts of the yield curve are inverting and investors are spooked. In this case it’s been bad enough where I’m getting emails and PMs asking what they should do now that the curve is inverted. If you trade stocks, you may need to stand on your head to understand this one. More specifically, you have US Treasuries. Now, to measure the supply and demand for treasuries, we look at the yield. A low yield means high demand, a high yield means low demand. If the 10-year has a yield of 2.90% and then moves to 3.00%... what does that mean? Yields up, that means the bonds sold off. Now here’s another good rule of thumb about treasuries. The yield tends to be a function of inflation expectations. Now we have the yield curve, which compares treasuries as a function of their duration. You’ve got 3 month, 2 year, 5 year, 10 year, 20 year, and so on. In a “normal” bond market, the demand for short term bonds is higher than long term bonds. The short term bonds have a lower yield than long term bonds. But when you have more demand for long term bonds, it means investors are buying duration to lock in rates before the spectre of deflation sets in. If that happens, the yield curve inverts. And it’s pretty good in predicting recessions. We got that out of the way. I don’t like talking about it because I have to stand on my head to think about it. Let’s get down to what it means for traders. As of this writing, some parts of the curve have inverted. But the one you really want to focus on is the 10-2 spread. The difference between the 10 year yield and the 2 year yield. Right now, it hasn’t flipped. Right now, I’m not concerned until this part of the curve inverts. Before the Great Financial Crisis, the 10-2 spread went negative in 2006. It was a full year before the overall market topped out and rolled over. A proper yield curve inversion can lead recessions by 18-24 months. And the stock market can rally further and longer after the yield curve. Due to availability bias, many people think that the next recession will be just like the last one. Remember that? A nasty credit crisis, massive unemployment, and a stock market that gets cut in half. There’s no guarantee that it will be like that. You can have a market that just trades sideways during a recession… or it could bottom out before the recession finishes. On top of that, if too many people are watching the yield curve, the signal will turn out to be a dud as too many react too quickly and it gets priced in. Remember-- the stock market is a leading indicator of the economy. It doesn’t have to behave a certain way during a recession. I will ask you this… how many other times has some new catalyst presented itself and you got shook out of your positions because you didn’t have a plan? Got a 401k? Fine. Dollar cost average, have a systematic rebalancing plan, and keep your fees low. Now that we’ve got the long term timeframe out of the way, let’s talk about where I sit. With my income trading strategies, my timeframe is about a month. That means I could care less about the pending recession that is over a year out. I care about what happens in the next 20 trading days. This is yet another indicator that can easily spook the markets, but once that flush happens there are so many investors in cash from the end of 2018 that they’ll provide support. My bet continues to be that the markets will be in a state of high-reversion for the next few months. I talk more about that here. While everyone and their mother are now obsessing about treasury rates, here’s my concern. 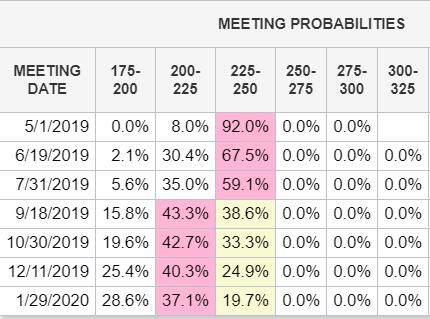 This is a table showing the implied probabilities in fed fund futures. This is a futures market that predicts what rates the Federal Reserve will set. Right now, the market is pricing in a 66% chance that there will be a rate cut in October. Last time the Fed cut rates, it was because the economic data got so bad that they had to do something to ease financial conditions. Right now unemployment is at lows and the stock market is about 5% from all time highs. Have we really seen enough damage to justify a rate cut? Or is it that the “smart money” in the futures market is anticipating a deterioration in the data (and stock market) over the next few months? That’s what I’m keeping an eye on. The yield curve is “cocktail party” analysis. It's good to know the mechanics but probably isn't useful in your trading decisions. It will make you sound smart in front of your friends… and it may matter eventually. Yet if you’re trading timeframe is anything under 6 months, then you should focus on the price of the asset you’re trading instead of trying to find some obscure indicator that will absolutely mark the top in the market. Don’t overthink it. Know your edge, and exploit your edge.